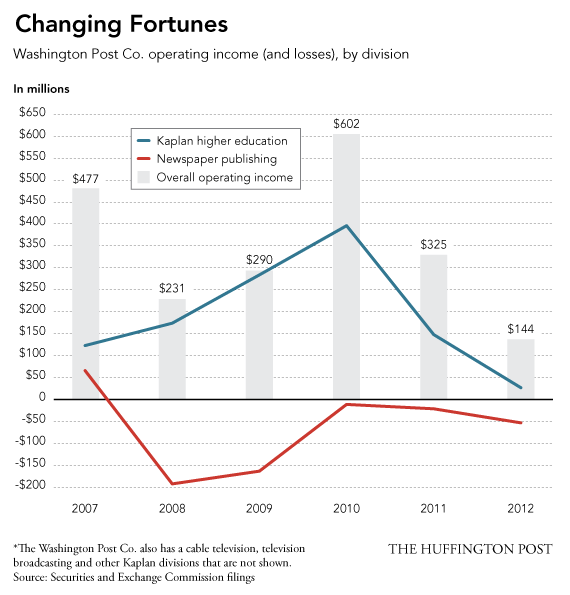 Even as the Washington Post saw its circulation diminish and its advertising revenues evaporate in recent years, the paper's parent company could draw on a conspicuous center of growth -- a chain of for-profit colleges known collectively as Kaplan Higher Education. So important was Kaplan to the overall health of the business that Washington Post Co. chairman and chief executive Donald Graham came to describe his enterprise in new terms. "When I became CEO in 1991 and certainly before that, the Washington Post Company was a media company," Graham told shareholders at a meeting six years ago, according to a transcript. "In a very short time we're going to be calling it an education and media company, because that's where the majority of our revenues are going to be coming from." But that projection ultimately collided with the regulatory activities of the Obama administration, which three years ago put forward new rules aimed at cracking down on the aggressive -- and some say predatory -- recruitment practices employed by Kaplan and other for-profit schools. Collectively, such institutions have left many students with crushing debts and meager job prospects. By the end of last year, just as Graham and his company now acknowledge they began seeking a buyer for the Washington Post, operating income at Kaplan's higher education division had plummeted to $27 million from $406 million two years earlier, a drop of 93 percent, according to the company's securities filings. Few can say with certainty what prompted Graham to surrender control of the Washington Post -- the newspaper his mother, Katharine Graham, oversaw through Watergate and the Pentagon Papers, and where he had worked as as a reporter and eventually as publisher. But the shocking disappearance of the Kaplan money, funds that had masked grave shortfalls at the newspaper, may well have hastened the process. A spokeswoman for the Washington Post Co., Rima Calderon, wrote in an email that performance at Kaplan "did not figure in the Post Company's sale of the newspaper," and pointed to comments from Graham earlier this year that "the future of Kaplan is the future of The Washington Post Company." After announcing the $250 million sale of the paper to Amazon.com founder Jeff Bezos on Monday, Graham is left with a cable news division, a newly acquired healthcare business, six television networks across the country and an education division that is a shadow of its former self. For more than five years, the company's Kaplan higher education division, which ran a network of more than 60 for-profit colleges that enrolled more than 100,000 students at its peak, was one of the most profitable arms of the Washington Post Co. Even as newspaper subscriptions rapidly declined, leading to losses of more than $150 million in 2008 and 2009, Kaplan's profits continued to support the company. But ever since the federal government intensified scrutiny of for-profit colleges beginning in 2010, with congressional and media investigations revealing high-pressure sales tactics to boost enrollments and revenues, the for-profit college industry has been in free fall. Enrollments at Kaplan's online and ground campus schools dropped from a high of more than 100,000 at the end of 2009 to about 65,000 at the end of last year, a more than 37 percent decline over three years. "For a short while, it looked like Don Graham had come up with a way of propping up this paper by having a lucrative side business," said Barmak Nassirian, a higher education consultant who has followed the rise of for-profit colleges and now works at the American Association of State Colleges and Universities. "What this subsidy turned into was one losing business attached to another losing business." The Washington Post Co. had purchased Kaplan in the 1980s as a test-preparation business for high school and college students. In 2000, Kaplan bought Quest Education Corp., which operated a network of career colleges that offered bachelor's and associate's degrees to those in the healthcare and business fields. Kaplan quickly expanded the higher education division, which was able to draw on federal student loan and grant dollars -- a source of revenue that would grow into the billions. By 2007, Graham was exuberant about the company's shift toward higher education. "Going forward we have excellent prospects as a company and the primary reason for that is spelled K-A-P-L-A-N," Graham said at the 2007 shareholders meeting. But as enrollments skyrocketed, federal statistics showed that students were faring poorly. A Senate report released last year found that Kaplan's student loan default rates were the third-highest of 30 schools examined, and were 25 percent higher than the default rates across the for-profit college sector. Recruiting documents obtained by the U.S. Senate Health, Education, Labor and Pensions committee showed aggressive tactics that Kaplan sales managers used to entice students to enroll. Recruiters were instructed to find students' "pain and fears" during sales calls to convince them that a college degree would solve their problems. "If you don't make this change, how do you think your future looks?" one document read. As the federal government stepped in with proposed regulations to deter student loan defaults in 2010, Graham became one of the most high-profile spokesmen for the industry, meeting with White House officials in 2011 to lobby for a weakening of the rules. Kaplan spent more than $1.3 million lobbying against proposed regulations in 2010 and 2011, and brought on former White House communications director Anita Dunn as an adviser. The lobbying efforts by Kaplan and others in the industry eventually resulted in watered-down regulations. But bad publicity surrounding the government scrutiny scared some students away. In response to criticisms of its high-pressure recruiting tactics, Kaplan introduced a program that would give students a 5-week free trial period to see if they liked the programs. Enrollments plummeted, and nine campuses have closed since last year. Analysts said the sale of the newspaper is an acknowledgment that Kaplan's fortunes aren't turning around any time soon. "I don't think anyone within the Washington Post thinks the higher education business is a booming business," said Bradley Safalow, chief executive of Please Act Accordingly, an investment research firm. "As the CEO of a public company, no one is going to sit here and allow them to continue to bleed out capital." Craig Huber, a media and Internet analyst at Huber Research Partners, likened the sale of the Post to the company's sale of Newsweek three years ago. "They were more patient with it because the name is on the door and they have owned it since 1933," Huber said of the newspaper. "But they've lost their cushion with education, which made a lot more money a few years ago. I think they saw the handwriting on the wall, and moved to get the newspaper off the books."